Yet another great weekend event for Airedales, and all. Hunting Working Airedales’ 31st Field Nationals was HOT, HOT, HOT. Again held at Holly Hills Game Preserve near Chillicothe, Ohio, the annual fall event sweltered at times with mid-80 degree temps. But HOT, HOT, HOT also applied to the Airedale action in the field. Three days packed for Airedales made for a full-speed ahead weekend, no matter the weather. Thursday evening’s Hospitality Suite at our headquarters hotel, the Quality Inn in Chillicothe, was the first gathering spot for Nationals attendees. A complimentary supper made it easy to grab a plate and carry on multiple conversations with old friends while connecting with newcomers. Friday at the Nationals starts with “fur,” which means raccoons to Airedales, plus events to get new dogs and people going. 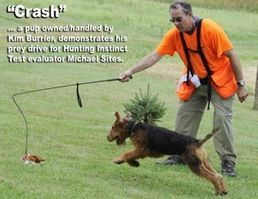 This year the Airedale Terrier Club of America [ATCA], our breed’s AKC parent club, again teamed up with HWA to hold an ATCA Fur Test at our HWA Nationals. 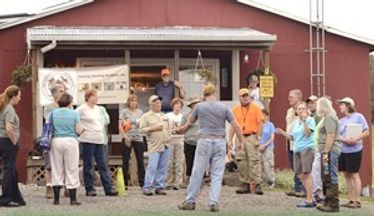 Lawrence Alexander, the "Dean of all Fur Test judges", couldn’t attend – so Kim Burrier, assisted by Chris Halvorson, stepped in to judge, while Craig Contofalsky ageed to be the judge at the raccoon tree, in spite of the nearby poison ivy. We had a good entry of two Senior Test dogs and six Junior Test dogs. Some of the dogs were good at tracking the trail of raccoon scent, but they didn’t look up and/or bark at the caged raccoon hidden in the tree branches. Other dogs strayed off the track. In the end, one dog, Mike, owned/handled by Chris Halvorson, ran the track, found the raccoon, and barked within the time limit to qualify in the Senior Fur Test. Since the Fur Test takes place in the woods where there’s no room for spectators, Friday morning’s alternate activity was the starting session of the Beginners’ Workshop presented by Dawn Schuster. 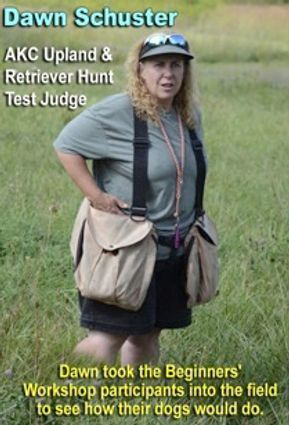 Dawn is an AKC Upland (Spaniel) Test judge who did triple-duty this year at our Nationals by presenting workshop sessions as well as judging our Upland and Retriever Tests. 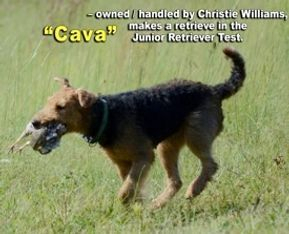 Dawn’s experience with Hunt Tests (as well as her success in training her own English Cockers) made her an excellent coach for Airedale owners just starting out with their dogs. 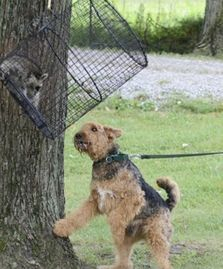 Friday morning wrapped up with the Barkathon, a favorite HWA fun event in which a dog gets a chance to bark and jump up at a tree holding a safely-caged raccoon. The dog that barks the most barks in one minute is the winner. We had 22 Airedales wanting to have their chance at barking, so we divided the contest in to two divisions: one for experienced dogs (those with fur-test titles), and the other for novice dogs (those without fur-test titles). Tuck, a young dog owned/handled by Diane Cullen, works his raccoon - winning the novice division, with 79 barks in just one minute! 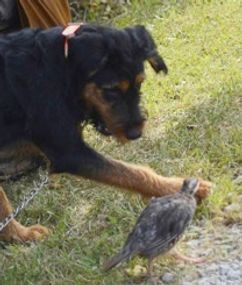 Mutt, an Airedale-mix owned by Jim Lanning, meets a chukar in the Beginners' Workshop. 2016's 31st Nationals were yet another spectacular event for HWA. All participants, members, guests, spectators & judges had a great time. Saturday is a day primarily devoted to the first sessions (also called the “land series”) of our HWA Upland (Flushing) test and Retriever Test. 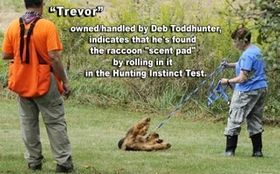 These tests – offered on Junior, Senior and Master levels – are competitions for dogs and handlers with basic training, on up to the considerable experience of a seasoned hunting dog. Meanwhile, the HWA Retriever Test participants and spectators gathered for the land series of the Retriever Test. Our judges were AKC Retriever judge Frank McKane and Dawn Schuster. Our entry included six Junior dogs, one Senior dog, and two Masters. The HWA Retriever Test, like its AKC counterpart, simulates the waterfowl hunting situation of a stationary hunter and dog waiting for a flock of ducks to fly over so that the hunter can shoot as many flyers as the opportunity permits. In the test situation, birds are thrown from behind blinds rather than shot, but the dog’s job is still to “mark” or watch where the bird(s) fall, and then retrieve all the fallen birds to the handler. The Retriever Test skills are marking (noting where the bird drops), and memory, as in remembering where each bird falls. Senior and Master dogs must mark and remember multiple bird falls before being sent to retrieve them. Though it may sound like a relatively straight-forward test, dogs who don’t regularly hunt ducks or train with retriever clubs often find it more difficult than anticipated. Of the starting group of Airedales, five would pass the Retriever land series and advance to Sunday’s water retriever series. 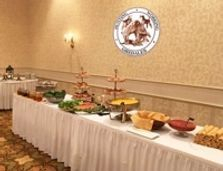 On Saturday evening, the HWA Banquet and silent Auction took place. This is our club’s biggest fundraisers and the big social event of every Nationals. Corally Burmaster and Pat Reed again ran the event with a full array of raffle baskets and auction items displayed. Also on display, a hickory-wood walking stick with a wrought-iron Airedale head finial hand-crafted and donated by Ron Swisher as our Limited Raffle item. So we bought tickets and bid on Airedale auction items as we enjoyed our dinners and a lot of dog talk. After a whole lot of barking and jumping, including one dog so eager that he slipped his collar to make a breakout run at the tree, our bark counters determined a tie for the experienced dog division. proud by barking 79 barks in a minute. On Friday afternoon, the Hunting Instinct Test was a popular activity. 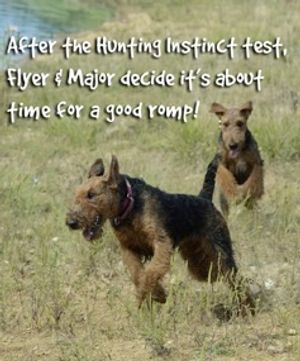 This test is open to pups and older untrained dogs who are six months of age and older.Each Airedale goes through a series of exercises that assess hunting aptitude, such as retrieving, tracking, finding and reacting to live birds and a raccoon, gunfire and swimming. Test evaluators Sherri Glass and Michael Sites scored each pup, with those scoring 70 out of a possible 100 points earning a certificate. But, whatever the score, all the pups have a great time, and all the spectators enjoy seeing the antics and reactions. 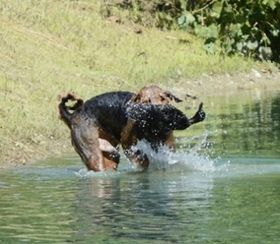 Corally Burmaster is among the Airedale breeders who watch the Hunting Instinct Test to see how pups of her breeding do, as well as noting what other bloodlines are producing. Corally commented: “I love to see that ‘Ah-ha!’ moment when a pup ‘gets it." By 4:30 on Friday afternoon, everyone was ready for some sedentary time while attending HWA’s Annual General Meeting outside Holly Hills’ clubhouse. This meeting gives everyone a chance to learn more about our club through its committee and financial reports. It also marks the official kick-off of our 2017 Membership Drive, and gave the club a chance to tell everyone how important our members are. Event Co-Chairs Patricia Nemeth and Kate Ostowski expressed their appreciation to the many volunteers who devote their time and efforts to making the Nationals run smoothly. The meeting adjourned, and everyone could then relax for the evening to prepare for a busy Friday. Saturday is a day primarily devoted to the first sessions (also called the “land series”) of our HWA Upland(Flushing) test and Retriever Test. 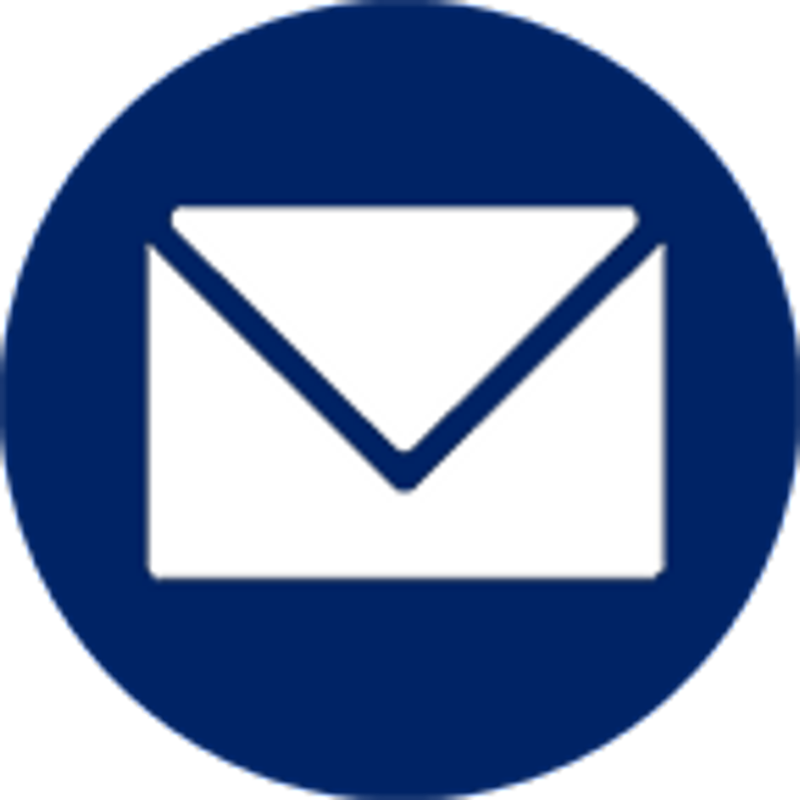 These tests – offered on Junior, Senior and Master levels – are competitions for dogs and handlers with basic training, on up to the considerable experience of a seasoned hunting dog. On Saturday morning, judges Dawn Schuster and Jamie Lands started with a good entry of five Junior dogs, two Senior dogs, and two Master dogs in HWA’s Upland Test. 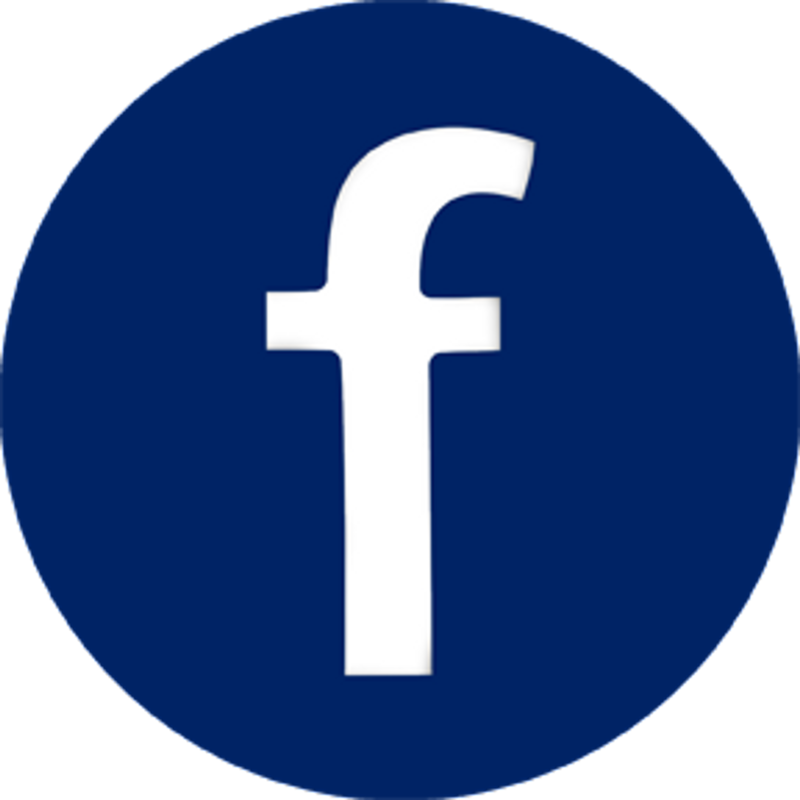 This test scores a dog’s nose and drive for finding and flushing birds, then retrieving ability to bring to birds to the handler. The Senior and Master dogs must demonstrate more obedience and teamwork with the handler. Throw in some happenings such as birds that flush badly or fly away; an Airedale who proudly brings in an impossibly long retrieve; or Airedales who become suddenly deaf to handlers’ commands, and things can get exciting. 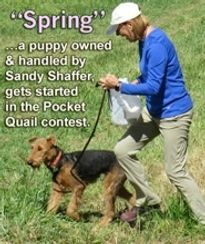 complete their Upland test in Sunday morning’s water series.After the test, our tireless judge Dawn Schuster put on her instructor’svest, and worked with more dogs in the Beginners’ Workshop. After lunch, George Gordon and Dale Burrier held an informal Grooming / Evaluation Clinic under their tent up near the clubhouse. George and Dale have a shared expertise in Airedales that made for a “bonus” educational experience tapped into by many of our attendees, who gathered around to watch and ask. Meanwhile, the HWA Retriever Test participants and spectators gathered for the land series of the Retriever Test. Our judges were AKC Retriever judge Frank McKane and Dawn Schuster. Our entry included six Junior dogs, one Senior dog, and two Masters. The HWA Retriever Test, like its AKC counterpart, simulates the waterfowl hunting situation of a stationary hunter and dog waiting for a flock of ducks to fly over so that the hunter can shoot as many flyers as the opportunity permits. In the test situation, birds are thrown from behind blinds rather than shot, but the dog’s job is still to “mark” or watch where the bird(s) fall, and then retrieve all the fallen birds to the handler. The Retriever Test skills are marking (noting where the bird drops), and memory, as in remembering where each bird falls. Senior and Master dogs must mark and remember multiple bird falls before being sent to retrieve them. Dawn’s starting point was a discussion of wind, and how dogs and handlers use wind while hunting. After the Hunting Instinct Test wrapped up, action moved to the field where Dawn Schuster’s Beginners’ Workshop resumed with some of the puppies as well as more experienced dogs who came for more advanced training tips. First lessons in flushing a chukar seemed to astonish some of the new dogs. For owners who came wondering if their dog would like this, the answer was a "leap-for-joy YES"! This year’s banquet event started with only one off-the-script item. Corally Burmaster and friends paused for a tribute to HWA President Chris Halvorson (full disclosure, this writer) who’s rotating out of office. It was a touching and total surprise that will be forever commemorated by the gift to Chris of a large metal Airedale Welcome sign. We started the morning with slightly cooler temperatures (thanks to the rain the night before) with the Upland (Flushing) Test’s water series’ retrieves at the small and pretty pond used in past years. 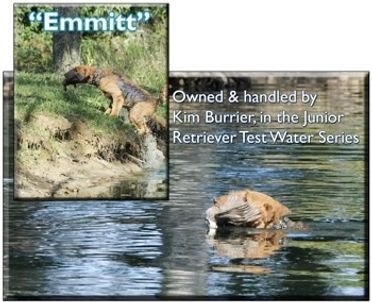 This was a familiar test exercise for several of the dogs who have done such water work while competing in AKC Upland tests. Judges Dawn Schuster and Jamie Lands were able to qualify five of the competing dogs, making for three new Junior Hunter Flushing [JHF] titles, one Senior Hunter Flushing [SHF], and one new Master Hunter Flushing [MHF]. Next, the action moved to a slightly larger pond in another part of the grounds for the water series of the Retriever Test. In light of the waterfowl intent of a Retriever Test, ducks would be used for these water retrieves. Frank McKane and Dawn Schuster were our judges. There’s always a certain amount of tension riding on these last crucial retrieves towards a possible new title. 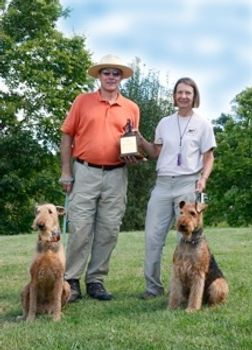 In 2014, Kate Ostrowski and Filson came to their Retriever Test knowing that if Filson could do his two water retrieves, he could be the first Airedale in 12 years to win the Joan Shea Gordon Memorial Trophy for the dog that qualifies in all three tests (Fur, Upland and Retriever) at the Nationals. Filson succeeded, much to the delight of all his friends. 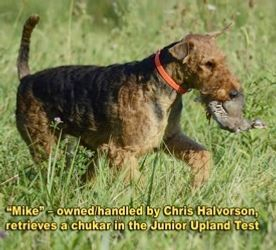 This year Mike, owned/handled by Chris Halvorson, came to the water in the Retriever test in the same position, having passed his Fur and Upland tests. Now he was two just retrieves away from the big trophy. Mike had practiced with ducks and likes to do water retrieves. The first duck thrown for Mike landed near the far bank. Mike jumped in and grabbed the duck, but was surprised to find himself so close to the far bank. Instead of turning around and swimming back, as his handler’s whistle ordered, he decided to get out on the far side of the bank and play with the duck a while before finally returning it to the handler. The second retrieve-attempt repeated the first performance, but worse. Mike played as only an 18-month old, out-of-control pup can play – even shaking the duck enough to tenderize the toughest bird. When at last Mike decided to come back to the handler, we knew that someday this would make a good story to tell. After all, though he didn’t get that trophy, the gallery voted him The Most Entertaining Retriever. "Mike" – owned/handled by Chris Halvorson – was unofficially voted "The Most Entertaining Retriever". Linda Sorak's "Euro" …doing it right"! That performance was fortunately followed by a true-blue retriever work by Euro, owned and handled by Linda Sorak. 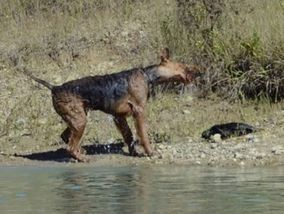 Euro ultimately became the only Airedale to qualify in this year’s HWA Retriever Test, which he did in addition to qualifying for his Junior Upland Test. 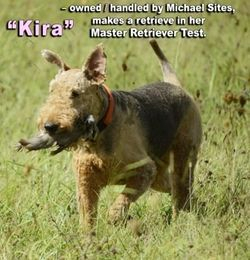 We’re delighted that this versatile Airedale can add HWA’s JHF and JHR titles to his performance resume. 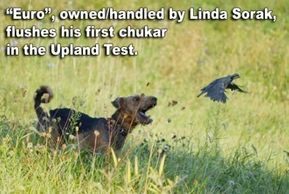 With the Upland and Retriever Tests completed by late Sunday morning, the Pocket Quail fun contest remained for the pups and new dogs. In this fun event, pups are given 90 seconds to lead their handler through a field that has many chukar wings hidden in the grass. When the dogs show their handlers they’ve nosed out a wing, the handler puts it in a bag. The dog who finds the most wings in 90 seconds is the winner. This year most of the pups found at least a couple of wings. The winner, however, was Louise, owned/handled by Elizabeth Morrill, who out-hunted all the others by finding 6 wings. Chris Cullen's "Roxie" ~ using her nose in the Pocket Quail Contest. 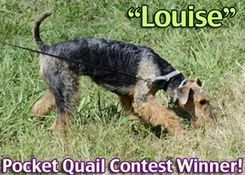 "Louise" – owned/handled by Elizabeth Morrill – hunted hard and fast to win the Pocket Quail contest. by Chris Halvorson (Lockport, NY) and bred by Corally Burmaster. Airecraft Test Pilot, owned/bred by Kim and Dale Burrier, handled by Kim Burrier (Newton Falls, OH). The Awards Ceremony is our traditional way to end the Nationals weekend. 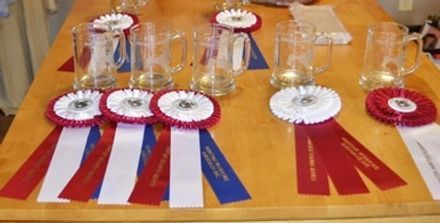 Ribbons, glassware and congratulations were awarded to all the test qualifiers. In addition, our club gives special recognition for notable achievements. The Brown Bess Memorial Award, given by Henry Johnson Jr., to the dog with highest score in the Upland Test was awarded to Euro, owned/handled by Linda Sorak. The Priscilla Cree Memorial Award, given by Lawrence Alexander to the highest scoring Fur Test dog went to Mike, owned/handled by Chris Halvorson. And The Road Dog Trophy, awarded to the dog who traveled to AKC or HRC tests to earn the most AKC or HRC legs since the last Nationals was shared by Kira, owned/handled by Michael Sites and Bruce, owned/handled by Chris Halvorson. 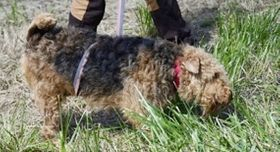 But with ribbons and awards or not, by all reports it was a very tired and happy group of Airedales and owners who left Holly Hills at the end of this Nationals. 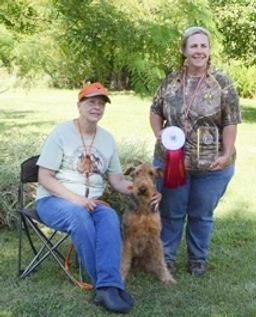 Pete with owner/handler Joyce Contofalsky and judge Dawn Schuster) earned his Senior Hunter Flushing (SHF) title and the Gunners' Choice Award for being the dog the gunners most enjoyed hunting over. Both Kira and Bruce earned four AKC Master Hunter legs since the last Nationals. Every year the HWA Field Nationals draws participants who come from as far away as California, Florida, Texas, Ontario, Alabama and the Carolinas – and more. Though the Nationals have many repeat attendees,we always delight in welcoming newcomers ~ and puppies can learn to hunt with us!